Carl Froch steps out to We Will Rock You - and with a look of determination in his eyes! More fireworks go off to herald the champ's arrival. Welcome to the Jungle blaring out of the speakers now. Froch shadow boxing. Focused. [jim-watt]As Jim Watt points out, there are so many questions going into this fight. We are about to find out all the answers. What is Carl Froch's motivation tonight? Does he want to put George Groves finally in his place? Does the huge purse have something to do with it? For Carl Froch to win tonight he’s got to drag everything out that he’s got left. How many more times can Carl Froch ask his 37-year-old body to produce the goods? As Michael Buffer introduces the fighters, Froch is clearly turning his back on Groves. He hasn't looked at him once since he entered the ring. Buffer calls out his famous words - and is joined by 80,000 fight fans! The crowd are going wild. Both fighters received huge receptions. Both have plenty of fans in attendance! And we're off! Both fighters meet in the middle, tentative. No one wants to make a mistake. No punch thrown in first 30 seconds until Groves lands a jab. And another. The fighters collide in the centre of the ring and grapple. Twice the ref steps in to separate them. 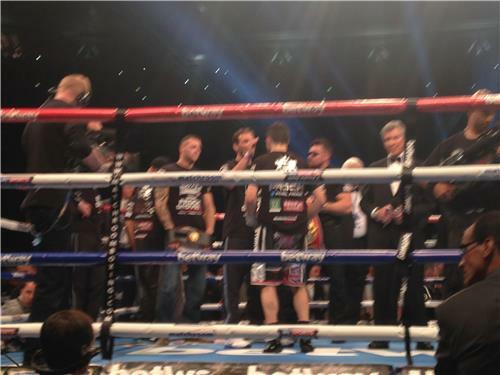 Froch has taken the centre of the ring . Only jabs exchanged so far. Froch lands one right just before the bell. Well - safe to say that was a better first round from the Cobra than last time!! [paulie-malignaggi]Paulie Malignaggi thinks the small ring at Wembley Stadium is going to favour Froch as the fight wears on. I'm going to reiterate the point that David Haye made earlier about the small ring. Groves was trying to use the ring at the end of the round and Froch was walking him down and the round ended with Groves up against the ropes. 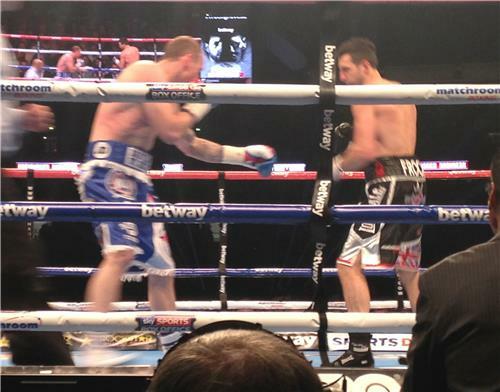 Jim Watt said before the fight Froch had to work behind his jab and he's doing just that. Keeping Groves at bay with his longer reach. This is a far more composed Carl Froch than what we;ve been used too. BUT HERE WE GO! Froch steps in and tries to land a right, the fighters grapple and Froch forces Groves to the floor. Groves throws a comment and a smile Froch's way. Groves throws a wild right but Froch responds with a flurry and the crowd roar with excitement. [betting]Who's your money on now? 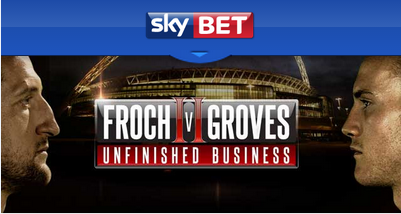 Sky Bet are taking live bets on the fight, get your in-play wager on now. Spencer Oliver and Jamie Moore are ringside for Sky Sports News Radio - tune in for live round-by-round updates. The crowd make themselves heard as there's a lull in the third but seconds later they're cheering as both fighters unleash, exchanging hooks. A good body shot with the right from Froch followed by a left. He's warming to this! Froch gets caught with a left on the way in but continues to take the fight to Groves. This is a small ring and Froch is hunting his man down. Groves lands a stiff jab though before unloading a right. Slow motion replays from the previous round showing the raw passion from both men as they both crash blows into eachother. Going into the fourth Jamie Moore has Carl two rounds to one up. 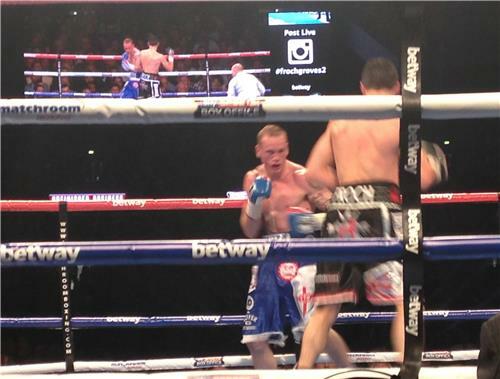 Carl comes forward but a right from Groves catches him and a follow up left stops Froch in his tracks. The champ backs off. He's soon back in his stride though, standing in the centre of the ring, trying to find his range with a jab. But Groves snaps forward with a right. Bang a stiff right from Groves catches Froch flush. Froch stands there and then launches and attack of his own. Froch gets his man on the ropes but Groves makes him miss. Froch unloads a couple of body shots in the final seconds. 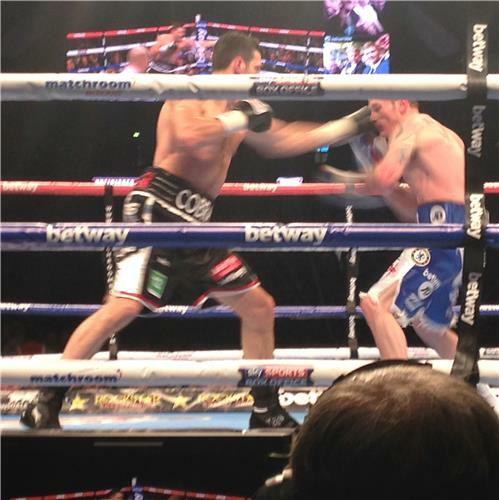 [betting]Groves warmed to the task in round four a little more but Froch appears ahead. Sky Bet are taking live bets on the fight, get your in-play wager on now. [jim-watt] Jim Watt believes Froch is just holding the edge in the early stages, in complete contrast to their November clash. It's a different Carl Froch but also a different George Groves. This is not the same powerhouse that came into the ring last time.